The Kettle Hat 13th Century. The original design was a simple bowl with a big rand. It was particularly used by archers and sappers, for it allowed the head to move freely, gave a good protection against missiles coming from the top, and did not hinder eyesight. It's made of solid hand-forged 18 gauge steel, has rivets, and a rounded skull-cat with a center ridge. 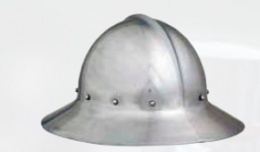 The kettle hat was common all over Medieval Europe. It was called Eisenhut in German and chapel de fer in French (both names mean "iron hat" in English). It was worn by troops of all types, but most commonly by infantry. This page was last modified on 26 October 2013, at 18:46.